Identification: Long labial palpi point forward; antennal clubs are pointed. 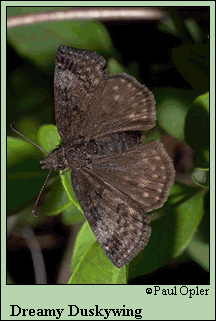 Wings are black; forewing has no transparent spots but is dusted with gray scales and has bands of dark spots. Male has a costal fold containing yellow scent scales; female has a patch of scent scales on the 7th abdominal segment. Life history: To seek females, males perch in openings, flats or depressions near woods. Females lay eggs singly on host plant leaves. Caterpillars feed on leaves and rest in leaf nests. Fully-grown caterpillars hibernate in leaf shelters. Flight: One brood from April to early July; perhaps a rare second brood in the southern Appalachian Mountains. Caterpillar hosts: Willows (Salix), poplars, aspens (Populus), and occasionally birch (Betula). Adult food: Nectar from flowers of blueberry, wild strawberry, blackberry, Labrador tea, dogbane, New Jersey tea, winter cress, purple vetch, and lupine. Habitat: Woodland openings or edges. Range: Boreal North America from the Northwest Territories east across southern Canada to Nova Scotia; south in the western mountains to southern Arizona and southern New Mexico; south in the east to Arkansas, northeastern Alabama, and northern Georgia.